Hundreds of people were participating Sunday in the funeral of Amir Ohana, the Israeli who went missing in Uman and was found Saturday. Hundreds of people were participating Sunday in the funeral of Amir Ohana, the Israeli who went missing in Uman and was found Saturday, drowned in lake. 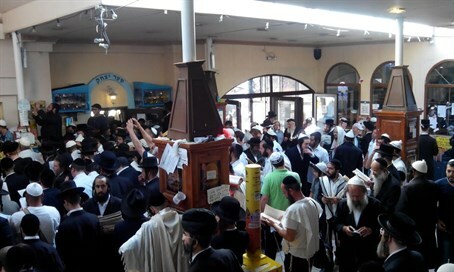 The funeral took place outside the tomb of Rabbi Nachman of Breslov, who is buried in Uman. Ohana's body is set to be flown to Israel late Sunday, and he will be buried in his hometown of Bat Yam on Monday. Ohana leaves behind a wife and three young daughters. He was a “regular” in Uman, traveling for several years on Rosh Hashanah and on other occasions. Tens of thousands of people from Israel and the throughout the Jewish world came to the site this year to celebrate Rosh Hashanah at the gravesite of Rav Nachman of Breslov, founder of the Breslov Hassidic sect. According to Breslov tradition, Rabbi Nachman promised to intercede in Heaven for the good of any Jew who celebrated the holiday at his gravesite. Ohana's body was found Saturday in a lake in the city by ZAKA volunteers. "One of the ZAKA volunteers who had flown out from Israel on Thursday saw the body floating in the river that runs through Uman," read a ZAKA statement on Saturday night. "Ohana z"l was found wearing his Shabbat clothes, without shoes or socks. It would appear that he had fallen into the river, after sitting on the river banks." Apparently Ohana was struck by an epileptic fit while sitting by the river, causing him to fall in and drown, officials said. Ohana, a married father of three from Bat Yam, had been missing since last Tuesday, when he went out to the woods to be alone on the last day of the two-day holiday.